ACCUEILLANT – L’ancien patron du Bistrot de l’Alouette vous accueille dans ce nouveau restaurant : Le Bistrot de Tutelle. Au programme : une ambiance conviviale, et une carte entre tradition et création. Very nice meal. Great wine. Nice ambiance, well located, excellent service. The food level was not consistent, however: very good starters and well cooked mains, but the desserts were disappointing (the moelleux au chocolat was actually a brownie and baba au rum was average). Correct wine list. Still a goid adress and I would return. Such a lovely evening! This restaurant has a lively atmosphere and fabulous service and the meal was beyond amazing. I wanted to lick the plates! Our dinner was all perfectly fine, except that the duck was rather tough. Highly disappointing lunch at this Bistrot which had such promising reviews. The 35,- menu was of very disappointing quality and seemed only slightly better in quantity than the 16,50 daily lunch menu that most of our neighbors had. Service was slow and - although polite- not too forthcoming. They seemed very busy and overwhelmed. The steak was ok, but not of the quality you’d expect at such a price. Only the goose liver Pate starter was good. Cafe gourmand Dessert was a very poor collection of greasy buttery batters with strawberry sauce. And then the wines! I didn’t think it was possible to get such under average wine in Bordeaux, and that at 7,- EURO A GLASS!! Please mind that the 20% discount doesn’t count on menus. If you have to eat anything here, just take the 16,- lunch menu. Do t spend more. 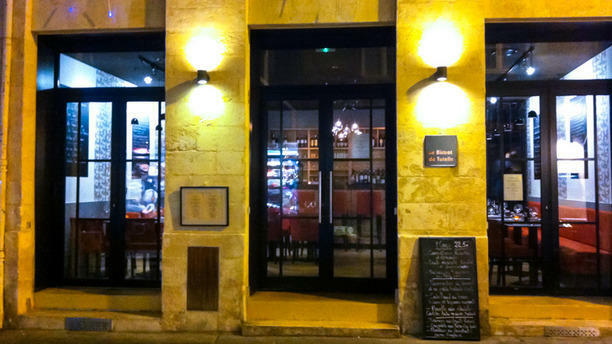 Bet if you are going to spend 50 euro pp, go to Brasserie Bordelaise which never disappoints. I feel kind of robbed. Very enjoyable food, the duck was the standout. Service was attentive and the overall impression of the place was very positive. Very unassuming restaurant but the service was fast and had excellent food! Nice restaurant, good service, well located. We took meat and fish, both were excellent. The French frize were a bit disappointing.